Sinto America’s Surface Treatment Test Center, a design/engineering operation for customer-specific applications, is located at our Grand Ledge, Michigan facility. Sinto’s test center is equipped with our large and small drum blast machines along with spinner hangers, table blast and tumble blast. For more information, visit https://sintoamerica.com/surface-treatment-after-sales-service/. 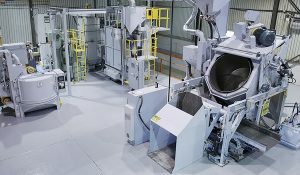 “The facility includes full scale shot blasting machines to test your parts as opposed to a machine that will “simulate” the results. This allows the customer to accurately decide what application best fits their needs.” – Todd Breault, VP Surface Treatment. Sinto has long strived to be the leader in the design and manufacture for all surface treatment, metal finishing and shot blasting applications. From standard to custom, simple or complex, or a single piece of equipment to a full system, that’s the Sinto difference. Your one stop solution.